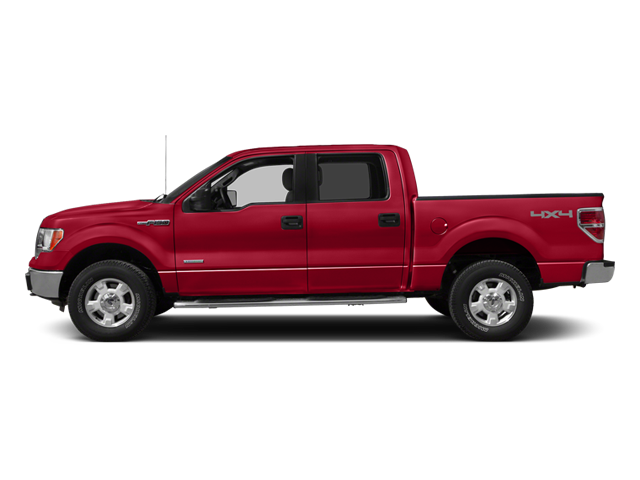 Our 2014 Ford F150 FX4 SuperCrew 4x4 is shown in Race Red. This machine is powered by a stout 5.0 Liter V8 that offers 360hp on tap while paired with a 6 Speed Automatic transmission and Ford's Tow/Haul mode. Secure up to 21mpg while enjoying a quiet ride and find that reliability and performance are what have made the tough F-150 one of the top selling full-size trucks on the market today! Best in class once again in towing and payload capacity, this capable truck has a removable tailgate with lift assist bedliner, running boards, fog lamps and unique FX painted grille and FX4 badging. Inside this FX you will enjoy the durable and stylish feel with comfortable seating and easy to read modern display center. There are great storage spaces, available satellite radio and you can sync your phone to the CD stereo to become hands free. Heated leather seating and sound deadening carpet add to the excellent acoustics that Ford offers along with all sorts of power gadgets that make every moment in an F-Series a joy. Ford always comes through with safety and the F-150 ranks at the top. Its high strength steel safety cage keeps you secure along with 6 standard airbags, SOS post-crash Alert, Trailer Sway and Roll Stability control and anti-lock brakes. F-150 has everything you could ask for in a full-size truck. Whether it's for work or play you have made an excellent choice! Print this page and call us Now... We Know You Will Enjoy Your Test Drive Towards Ownership! Hello, I would like more information about the 2014 Ford F-150, stock# 3051M. Hello, I would like to see more pictures of the 2014 Ford F-150, stock# 3051M.